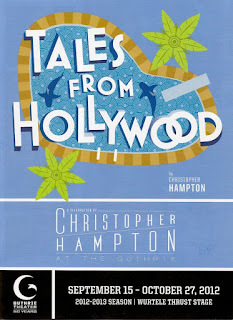 To complete the Christopher Hampton trilogy that is the beginning of the Guthrie's 50th anniversary season, I saw Tales from Hollywood last night. And it is perhaps my favorite of the three plays, which also include the historical drama Appomattox and the small but intense relationship drama Embers. It's funny and clever, yet sad and moving, with staging that turns the Thrust stage into a Hollywood studio. 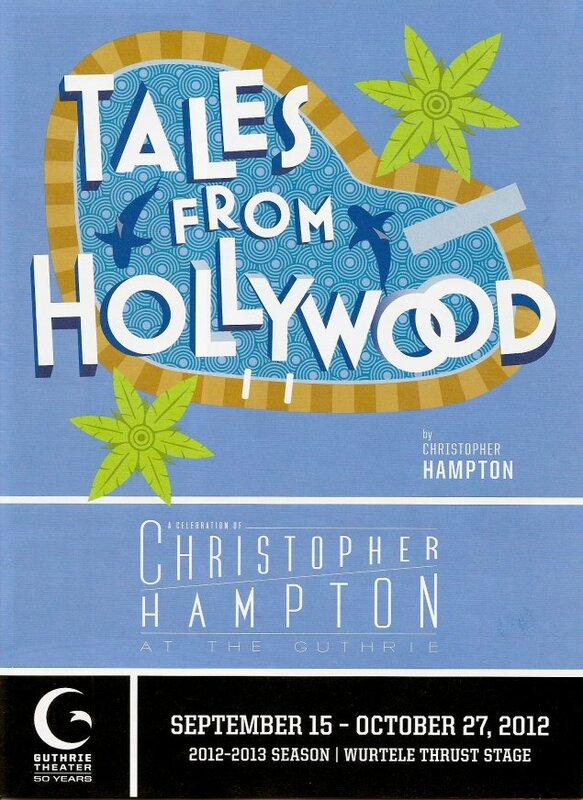 Like Appomattox, Tales from Hollywood is based on true events in American history. The time is the 1930s and 1940s, the place is Hollywood. The narrator and main character is real-life Austro-Hungarian writer Ödön von Horváth. The play begins by telling us that Ödön died when a tree branch fell on his head in 1938, and then goes on to re-imagine his life if he had lived and followed many of his fellow European writers to Hollywood to make a living writing for the movies. German writers Bertolt Brecht and brothers Heinrich and Thomas Mann are among those writers who were forced to leave their native country at a time when the Nazis were burning books (and, of course, committing many more awful crimes). Ödön leads us through the experience of writing "scenarios" for movie studios when he could barely speak English, adjusting to life in a different culture, and dealing with being German (or Communist?) in post-WWII America. The fabulous cast is mostly led by Guthrie newcomers, with many Guthrie favorites in the ensemble. Lee Sellers as Ödön is wonderfully sympathetic and a great guide throughout the story. He has no accent while narrating or talking to other Europeans, but speaks in accented and fragmented English while speaking to Americans. A nice touch, it always annoys me when, in American made movies, people in other countries are seen speaking English with an accent to each other when they should be speaking their native tongue. This works well to differentiate the fluency and comfort of speaking with one another from the awkwardness of trying to communicate in a second language. Another couple of Guthrie newcomers are standouts in the cast. Keir Dullea, as Ödön's mentor Heinrich Mann, conveys that lost feeling of an emigre who's not comfortable in this new life. Allison Daugherty is excellent as his tragic wife Nelly. Guthrie veteran Stephen Yoakam once again gives a dynamic performance as the slightly crazy Bertolt Brecht. And I had fun spotting some of my faves (Summer Hagen, Charity Jones, Bill McCallum, John Skelley, Anna Sundberg) in the background of the scenes, and wishing they had more to do. The staging of this play is really unique, with lots of little movie tricks. The stage looks like a movie studio, with ensemble members directing huge spotlights. 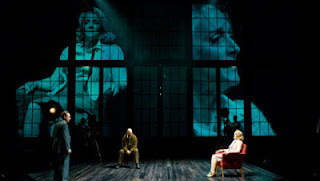 Some scenes are filmed by an old camera off the stage, with the image projected onto the backdrop of the stage, so you feel as if you're watching an old black and white movie. There's even someone doing sound effects just off-stage. Newsreel footage is also displayed on the backdrop, depicting the events being discussed. It's a pretty high-tech show, but in an inventive way that suits the Hollywood theme of the play. Now that I've seen all three of the plays in the "Christopher Hampton Celebration," I was thinking about what they all have in common. The obvious answer is history. In Tales from Hollywood, it's the history of German emigres in the early days of Hollywood. In Appomattox, it's several centuries of history of the Civil Rights movement. In Embers, it's the personal history of one man who can't let go of the past. I may have some more ideas on that as I sit with it a bit, but for now I will just say that any of these three diverse plays is worth checking out, depending on what you're in the mood for.